This week seems to be developing a theme: technology of the developed world reaching out to the developing world, with some intriguing results. The One Laptop Per Child project has been carefully followed in this space, and the original story has been subsequently augmented and commented on, most recently this week. 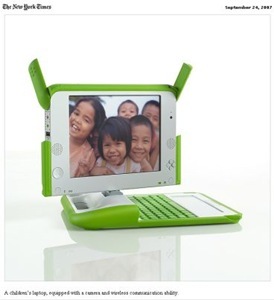 Here’s an update on OLPC, published this week in the NYTimes. Putting aside the question about how a $100 laptop has inflated to two for $399, the OLPC continues to break new ground even in marketing. God knows that there are pockets of the third world within these preciously regarded borders of ours, many within our biggest cities. Then it becomes a $399 charitable contribution, serving to further education among the deserving needy in our own country as well as beyond. If this promotion serves to prime the production pump, so as to assure economic deliveries to the nations like Peru and Mexico and Italy (for Ethiopia — now that’s fitting!) that have committed to the project, then it’s absolutely worthwhile. This entry was posted on Wednesday, September 26th, 2007 at 8:16 pm and is filed under Geopolitics, musings, Technology. You can follow any responses to this entry through the RSS 2.0 feed. You can leave a response, or trackback from your own site. Thank you for keeping up with this important project and making it known. I applaud you, and thank you, and pray for you and the success of your mission!–which is to make a more viable and vibrant life possible for every child. If Mr. Craig Barrett of Intel were serious about helping you instead of undercutting you and trying to horn in on what he really sees as “market share” ultimately, he would be contacting you, discussing WITH you, and making proposals/brainstorming possibilities WITH you–instead of making supposedly objective soundbite points. Let’s hope he changes his mind and does the former! Please think of yourself and make sure you are staying healthy. [He travels 330 days per year, promoting the project.] You need to stay strong and be well for the long haul, enjoy your one life, too,and don’t cheat on your physical check-ups. Please never give up. Though it may not all happen as we (man) plans, I believe God will bless your mission, make it more and more viable, and fulfil your Dream. I appreciate your comments, and am grateful that you shared with us your communication with Mr. Negroponte. With so many billions to educate, I hope there’s room under the “cheap internet appliance for global education” tent for all of the players. Thanks for looking in, and taking the trouble to enhance the discourse.